President Donald Trump reportedly owned then-acting FBI Director Andrew McCabe in a phone call following the firing of James Comey, savagely telling him that he should ask his wife how it felt to be a loser. Jill McCabe, the wife of the man who was in charge of the investigation into Trump’s supposed Moscow ties, accepted a $467,000 donation from an ally of Trump’s presidential rival, Hillary Clinton, while running for Senate in 2015. The funding came from Virginia Governor Terry McAuliffe and was widely seen as inappropriate. The savage dig reportedly came during a phone call from Trump to McCabe in which he demanded to know why James Comey was allowed to fly back to DC in an FBI airplane, despite being fired. In response, McCabe said that while he hadn’t authorized it, he would have if Comey asked. This reportedly lead to Trump blasting the former FBI head. Trump fell silent before lashing out at McCabe and telling him to ask his wife what it felt like to be a loser, according to NBC. The FBI head replied, “OK, sir,” before Trump ended the call. Last year, Senator Chuck Grassley sent a letter to Deputy Attorney General Rod Rosenstein about his concerns over McCabe’s financial ties to McAuliffe. “Public reports of his meeting with a longtime Clinton and Democrat party fundraiser, Governor Terry McAuliffe [Va.], and his wife’s subsequent campaign for public office being substantially funded by McAuliffe’s organization raise serious questions about his ability to appear impartial,” Grassley wrote in the letter. 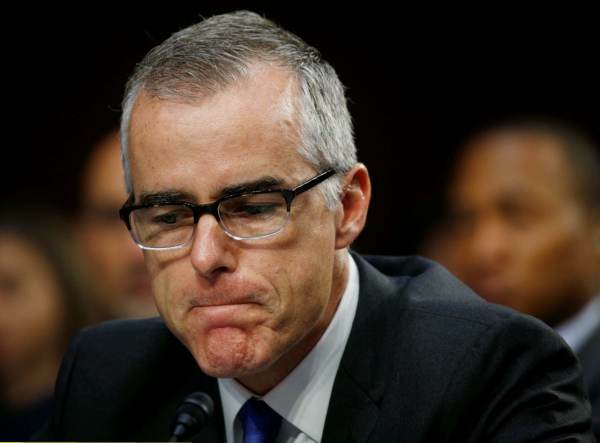 “The financial and political links between Mr. McCabe and Gov. McAuliffe raise concerns about the appearance of impartiality in the course of not only the Clinton investigation, but the reported McAuliffe investigation, and the ongoing investigation of alleged ties between associates of Mr. Trump and Russia,” Grassley continued.